PRECISE AND ACCURATE: Save yourself the hassle and measure perfect, level lines effortlessly and super-fast with this professional self-levelling instrument! Boasting an internal pendulum level with vertical accuracy range of ± 4° and 230 ft working range (with a receiver), the AdirPro Cube 360 cross line laser will make all your wall studding, shelf installation, picture hanging and tile aligning tasks a breeze! MADE TO LAST: Extremely durable with a slip-resistant, ribbed rubber housing for extra stability and scratch-free protection, this compact laser line levelling tool will easily fit in the palm of your hand and let you take it with you anywhere with ease. 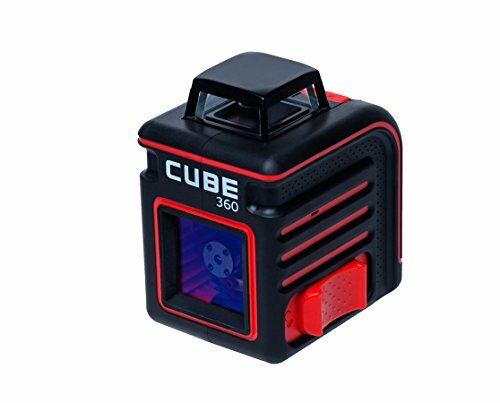 Carefully designed with a locking system to ensure the compensator stays in place during transportation, the CUBE 360 promises to outlast all your previous levels. USE RIGHT OUT OF THE BOX: Get your AdirPro Cube horizontal cross line laser complete with everything you need to get started right away! The package includes 3 AA batteries and an instruction manual to help you do your work frustration-free. Or why not purchase the Ultimate Edition and get a complete kit with a soft carrying case for your laser unit, a 3" high telescoping tripod, laser glasses, a wall mount and a durable plastic case to keep your entire kit safely stored and ready for use!